A new edition of the authoritative, single-source handbook to the selection, design, specification, and installation of flowmeters measuring liquid, gas, and steam flows. Miller (president, RW Miller Consulting) supplies the key information on seven-place equation constants and simplifying equations and includes many examples, graphs, and tables to help improve performance, and save time and expense. The revised edition features the latest ISO, ASME, and ANSI-related standards, meter influence quantities for flowmeters, and proposed orifice and nozzle equations. The nine appendices present discussions and proofs, and the generalized properties of liquids and gas. Provides definitive information on selecting, sizing, and performing pipe-flow-rate calculations, using the latest ISO and ANSI standards in both SI and US equivalents. Also presents physical property data, support material for important fluid properties, accuracy estimation and installation requirements for all commonly used flowmeters, guides to meter selection and accuracy, and coverage of linear/differential producers. Includes tabular and graphical representations of equations and extensive cross-referenced appendices. ``Anyone involved in the selection or operation of slowmeters should have access to this book''N--Applied Mechanics Review. Through two previous editions, thousands of international engineers have turned to this handbook for reliable and complete information on the selection, design, specification, and installation of flowmeters to measure liquid, gas, and steam flows within all engineering applications. Now the Third Edition brings you completely up to date, with new and expanded coverage of: The latest ISO, ASME, and ANSI-related standards--including guidelines for implementing them in your designs and installations. Meter influence quantities for all flowmeters; widely used flowmeters around the world, including thermal mass, GILFLO, "V" Cone, wedge flowmeter, Laminar Flow elements, and pilot tubes; The latest proposed orifice and nozzle equations, complete with examples. 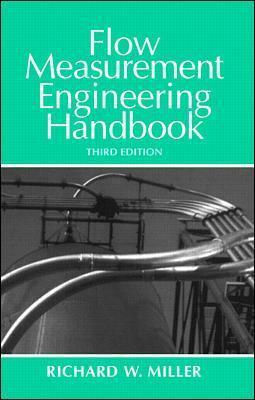 As practical as it is authoritative, this handbook serves as a single-source guide for selecting, sizing, and performing pipe flow rate calculations. It features both customary and SI equations throughout. . .complete coverage of fluid properties and equations of state. . .key information on seven-place equation constants and simplifying equations. . .and includes many examples, graphs, tables, and practical applications to aid in decision making, improve job performance, and save time and expense. This comprehensive reference covers everything from industry-wide standards and practices, to specific descriptions and examples, to physical property data and installation requirements. As a result, this edition remains the standard reference in the field and is the only guide to flowmeter engineering that you'll ever need. Introduction to the Differential Producer.